What conditions and diseases cause carpal tunnel syndrome? What are carpal tunnel syndrome symptoms? What tests do health care professionals use to diagnose carpal tunnel syndrome? What is the treatment for carpal tunnel syndrome? Is it possible to prevent carpal tunnel syndrome? What are complications of carpal tunnel syndrome? What is the prognosis for carpal tunnel syndrome? Which specialists are involved in the care of patients with carpal tunnel syndrome? 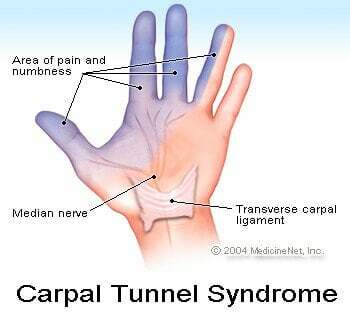 Carpal tunnel syndrome is caused by irritation of the median nerve at the wrist. Any condition that exerts pressure on the median nerve can cause carpal tunnel syndrome. Symptoms of carpal tunnel syndrome include numbness and tingling of the hand. Diagnosis of carpal tunnel syndrome is suspected based on symptoms, supported by physical examination signs, and confirmed by nerve conduction testing. Treatment of carpal tunnel syndrome depends on the severity of symptoms and the underlying cause. Carpus is a word derived from the Greek word karpos, which means "wrist." The wrist is surrounded by a band of fibrous tissue that normally functions as a support for the joint. The tight space between this fibrous band and the wrist bone is called the carpal tunnel. The median nerve passes through the carpal tunnel to receive sensations from the thumb, index, and middle fingers of the hand. Any condition that causes swelling or a change in position of the tissue within the carpal tunnel can squeeze and irritate the median nerve. Irritation of the median nerve in this manner causes tingling and numbness of the thumb, index, and the middle fingers -- a condition known as "carpal tunnel syndrome." For most patients, the cause of their carpal tunnel syndrome is unknown. Any condition that exerts pressure on the median nerve at the wrist can cause carpal tunnel syndrome. Common conditions that can lead to carpal tunnel syndrome include obesity, pregnancy, hypothyroidism, arthritis, diabetes, and trauma. Tendon inflammation resulting from repetitive work, such as uninterrupted typing, can also cause carpal tunnel symptoms. Carpal tunnel syndrome from repetitive maneuvers has been referred to as one of the repetitive stress injuries, although this relationship remains controversial in the evidence based literature. Some rare diseases can cause deposition of abnormal substances in and around the carpal tunnel, leading to nerve irritation. These diseases include amyloidosis, sarcoidosis, multiple myeloma, and leukemia. People with carpal tunnel syndrome initially feel numbness and tingling of the hand in the distribution of the median nerve (the thumb, index, middle, and thumb side of the ring fingers). These sensations are often more pronounced at night and can awaken people from sleep. The reason symptoms are worse at night may be related to the flexed-wrist sleeping position and/or fluid accumulating around the wrist and hand while lying flat. Carpal tunnel syndrome may be a temporary condition that completely resolves or it can persist and progress. As the disease progresses, patients can develop a burning sensation, and/or cramping and weakness of the hand. Decreased grip strength can lead to frequent dropping of objects from the hand. Occasionally, sharp shooting pains can be felt in the forearm. Chronic carpal tunnel syndrome can also lead to wasting (atrophy) of the hand muscles, particularly those near the base of the thumb in the palm of the hand. The diagnosis of carpal tunnel syndrome is suspected based on the symptoms and the distribution of the hand numbness. Examination of the neck, shoulder, elbow, pulses, and reflexes can be performed to exclude other conditions that can mimic carpal tunnel syndrome. The wrist can be examined for swelling, warmth, tenderness, deformity, and discoloration. Sometimes tapping the front of the wrist can reproduce tingling of the hand and is referred to as Tinel's sign of carpal tunnel syndrome. Symptoms can also at times be reproduced by the examiner by bending the wrist downward (referred to as Phalen's maneuver). The diagnosis is strongly suggested when a nerve conduction velocity test is abnormal. This test involves measuring the rate of speed of electrical impulses as they travel down a nerve. In carpal tunnel syndrome, the impulse slows as it crosses through the carpal tunnel. A test of muscles of the extremity, electromyogram (EMG), is sometimes performed with the nerve conduction velocity test to exclude or detect other conditions that might mimic carpal tunnel syndrome. Blood tests may be performed to identify medical conditions associated with carpal tunnel syndrome. These tests include thyroid hormone levels, complete blood counts, and blood sugar and protein analysis. X-ray tests of the wrist and hand might also be helpful to identify abnormalities of the bones and joints of the wrist. Take the Carpal Tunnel Syndrome Quiz! Initial treatment usually includes rest, immobilization of the wrist in a splint, and occasionally ice application. Those whose occupations are aggravating the symptoms should modify their activities. For example, computer keyboards and chair height may need to be adjusted to optimize comfort. These measures, as well as periodic resting and range of motion stretching exercise of the wrists, can actually prevent the symptoms of carpal tunnel syndrome that are caused by repetitive overuse. Underlying conditions or diseases are treated individually. Fractures can require orthopedic management. Obese individuals will be advised regarding weight reduction. Rheumatoid disease is treated with measures directed against the underlying arthritis. Wrist swelling that can be associated with pregnancy resolves in time after delivery of the baby. Several types of medications have been used in the treatment of carpal tunnel syndrome. Vitamin B6 (pyridoxine) has been reported to relieve some symptoms of carpal tunnel syndrome, although it is not known how this medication works. Nonsteroidal anti-inflammatory drugs can also be helpful in decreasing inflammation and reducing pain. Side effects include gastrointestinal upset and even ulceration of the stomach. These medications should be taken with food, and abdominal symptoms should be reported to the doctor. Corticosteroids can be given by mouth or injected directly into the involved wrist joint. They can bring rapid relief of the persistent symptoms of carpal tunnel syndrome. Side effects of these medications, when given in short courses, for carpal tunnel syndrome are minimal. However, corticosteroids can aggravate diabetes and should be avoided in the presence of infections. Most patients with carpal tunnel syndrome improve with conservative measures and medications. Occasionally, chronic pressure on the median nerve can result in persistent numbness and weakness. In order to avoid serious and permanent nerve and muscle consequences of carpal tunnel syndrome, surgical treatment is considered. Surgery involves severing the band of tissue around the wrist to reduce pressure on the median nerve. This surgical procedure is called "carpal tunnel release." It can now be performed by microsurgery with a small diameter viewing tube, called an arthroscope, or by open wrist procedure. After carpal tunnel release, patients often undergo exercise rehabilitation. Though it is uncommon, symptoms can recur. Complications of carpal tunnel syndrome are uncommon but include atrophy and weakness of the muscles at the base of the thumb in the palm of the hand. This can be a permanent complication if not corrected early enough. This can lead to lack of dexterity of the affected fingers. The outlook is generally excellent as carpal tunnel syndrome usually responds to the conservative measures reviewed above. Sometimes surgical operation is necessary, and residual weakness can occur. Carpal tunnel syndrome can be evaluated and treated by general physicians, including family practitioners, general practitioners, internists, as well as by orthopedists, rheumatologists, neurologists, and physiatrists. Koopman, William, et al., eds. Clinical Primer of Rheumatology. Philadelphia, Pa.: Lippincott Williams & Wilkins, 2003. Ruddy, Shaun, et al., eds. Kelley's Textbook of Rheumatology, 6th Ed. Philadelphia, Pa.: Saunders, 2001.